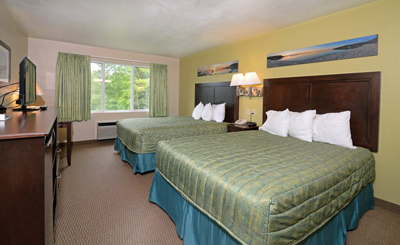 Stay near natural attractions as you enjoy a resort atmosphere at Parkwood Lodge Door County. This property, on nine acres, is also nicely nestled just north of Fish Creek’s downtown area and south of Ephraim’s picturesque harbor. Deluxe Lodge Rooms are updated, and have two queen beds, small fridge, microwave, coffee maker. Deluxe Kitchenettes are newly updated, and have a 2 burner range top, dishes, pots and pans, small fridge, microwave, and coffee maker. Open May - October, but avaialble by phone in witner for reservations. “It is the perfect location, where you are close to everything. But you feel like you are in the middle of nowhere when you are here—like you are in the middle of a park,” says Denise Stillman. Denise and her husband, Greg Stillman, are owners of the property since spring 2008. 2017: We met again with Denise and management to see the inmprovements to the property. We shot a new video (see above) As of August 2017, 39 rooms/suites have been upgraded out of the 59. The remaining 20 will be completed for next 2 seasons. We love that Denise and Greg continue to invest in, and improve, this special property. Check out #202 - which has 2 queen beds and a separate room with a queen and a bunk above - can sleep 7! The grounds inspired the couple to name the resort Parkwood Lodge. There are 59 different rooms/suites in four buildings with freshly painted bright exteriors and new windows. Also find a spectacular indoor pool, which was remodeled (new flooring, windows, paint and more) in spring 2008. The office, where guests check in, has access to wireless Internet service. Complimentary coffee is available here, and so are brochures about area attractions. 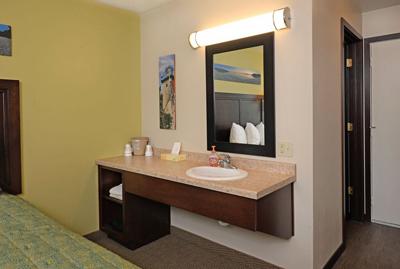 Before roaming the resort and checking out all the amenities, get settled in a room or suite. Parkwood Lodge has many affordable options for families, couples and girlfriends. For example, some accommodations have just a king-size bed, which couples may prefer. Others are set up with two double beds—nice for families. A suite (there are eight available) has a fully outfitted kitchen and a dining area with tables and chairs. Nearby is a sitting area including a woodburning stove and a sofa sleeper and other furnishings. The one we saw had one separate bedroom with a queen-size bed. We liked the natural light and access to an outdoor patio with a peaceful view of the courtyard and grounds. Another option is a one-room king suite. It is a spacious room with a king-size bed and a sofa (not sofa sleeper). Also, rooms with kitchenettes are available. We saw one of these and noted the fresh new carpeting. The conveniences remained in place: two beds, a small refrigerator and a range (some have microwaves instead) for heating a quick bite to eat. Ask about deluxe lodge rooms, as well—two queen-size beds, kitchen amenities like refrigerator and microwave—as well as other options at Parkwood. All accommodations have private bathrooms. Most of the rooms have a sink separate from the enclosed bathroom with tub and shower. So one person can be getting ready in front of the mirror above the sink while the other is in the shower—you get the idea. All rooms have TVs (some with cable, others also include DVD/VCR). But don’t just sit in your room and watch television. We loved the changes made in 2008 to the pool and whirlpool area. The wood walls and ceilin are now painted a bright white. There’s exposed ductwork on the ceilings, painted in an offbeat and eye-catching color of green. All new patterned concrete not only adorns the floor; it extends to the chair-rail on the walls. The pool itself was freshly painted blue, of course. Also, sliding glass doors have been replaced with windows throughout the spacious pool and whirlpool room. There is outdoor access to a deck and an all-new HVAC system in 2008. “It’s a real big pool for Door County and a great thing to have in all seasons,” Denise says. But if swimming is not your thing, head to the game room, where there are pinball machines, a pool table and other things to do. Outdoors, you’ll relish the resort atmosphere: lots of open space, dotted with picnic tables, benches and charcoal grills. There’s a playground area for young children and two tennis courts to enjoy, too. While you may enjoy relaxing at Parkwood, don’t forget that many Door Peninsula activities are available nearby. Take Peninsula State Park in Fish Creek, for instance. It has 3,776 acres affording golfing, trails for hiking, biking and skiing and more. American Folklore Theatre performs in the park. In fact, many people who enjoy immersing themselves in a state park—but prefer not to camp there--choose to stay at Parkwood, according to the owners.